Pyoderma gangrenosum (PG) is a neutrophilic dermatosis characterized by destructive, necrotizing, and noninfective ulceration of skin which most commonly involve lower extremities. We are reporting a case of 20-year-old male who presented with multiple nodulo-ulcerative plaques on both thighs which showed histopathological findings of granulomatous reaction. He was initially treated ineffectively with anti-tubercular agents. Following a revised diagnosis of PG, dexamethasone pulse therapy (100 mg daily for 3 consecutive days in a month) was initiated and the lesions improved with three such pulses. However, the patient was lost to follow-up. The patient presented a year later with relapse and pulse therapy was restarted. 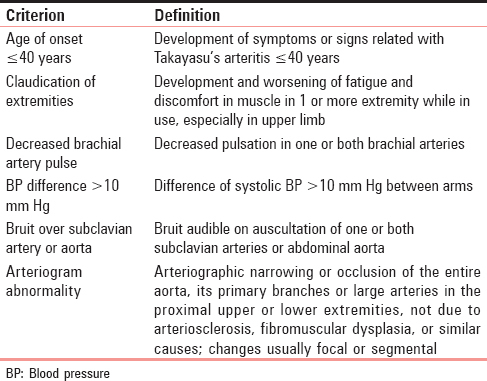 Incidental finding of absence of peripheral pulse and nonrecordable blood pressure on left upper limb led to the diagnosis of Takayasu's arteritis (TA). Skin lesions improved and the patient was referred for the management of TA. Association of PG with TA is rare and very few cases have been reported from India till date. Pyoderma gangrenosum (PG) is a neutrophilic dermatosis characterized by destructive, necrotizing and noninfective ulceration of the skin most commonly involve lower extremities. Takayasu's arteritis (TA) is a chronic inflammatory and fibrosing arteriopathy of unknown etiology. Association of PG with TA shows racial differences with high incidence in Japan and rare among North American and European patients. There are very few cases reported from India. Here, we report a case of PG revealing TA. A 20-year-old male presented with multiple nodulo-ulcerative plaques on both thighs with atrophy and scars for the past few years. The lesions started as small papules on the left thigh which gradually increased in size with central ulceration. After few months, similar lesion appeared on the other thigh and was associated with mild pain. There was no associated fever or family history of similar illness. Histopathology report showed a granulomatous reaction. He was treated with anti-tubercular therapy for 3 months with no significant improvement. Clinical diagnosis was reviewed, and diagnosis of PG was made. Pathergy test was negative. The patient was given dexamethasone (100 mg/day) pulse therapy for 3 days in a month and the lesions improved with three such pulses. However, the patient failed to follow-up. One year later, the patient presented with similar lesions. On examination, multiple nodulo-ulcerative plaques with atrophy and scarring of the surrounding skin on both thighs were seen [Figure 1]. Feeble pulse and nonrecordable blood pressure were found incidentally on the left upper limb. He was then referred to medicine department for thorough systemic examination. Routine laboratory investigations were within normal limits. Doppler study showed obstructive lesion at the arch of aorta beyond the origin of the left common carotid artery. The patient was diagnosed with TA Type 1 fulfilling American College of Rheumatology (ACR) criteria (3/6). Roentengram of the chest and soft-tissue neck were normal. Sputum for acid-fast bacillus was negative. Dexamethasone pulse therapy was restarted and showed significant improvement. The patient was referred to tertiary cardiac care for TA. However, the patient could not afford further treatment and failed to follow-up. In about 50% of cases, PG is associated with underlying systemic diseases, more commonly with ulcerative colitis, rheumatoid arthritis, and myelodysplastic diseases. Sixty-three cases have been reported from India till 2014, with only 19 cases of classical PG. Clinical presentation of PG can be diverse, and laboratory tests including histopathological examination are not pathognomonic. Hence, it is diagnosed by typical clinical features and by excluding other causes of ulceration. Classical lesions have been described as painful deep ulceration with a violaceous border, undermined edges and a necrotic base, and often recurrent and rapidly enlarging. Clinical variants include ulcerative, pustular, bullous, and vegetative forms. Since histopathologic findings of PG are not specific, biopsies are performed basically to rule out other causes of ulceration. In our case, atypical morphology of ulcers with scarring and atrophy, and granulomatous histological picture mimicked cutaneous tuberculosis, but antitubercular therapy was totally ineffective. Association of PG with TA is predominantly seen in young female patients. In 60% of cases, PG precedes TA. TA is defined as “granulomatous inflammation of aorta and its major branches” by Chapel Hill Consensus Conference on Nomenclature of Systemic Vasculitis on patients below 50 years. Vascular manifestations of TA, such as extremity claudication, ischemic ulcerations, gangrene, vertigo, syncope, and angina pectoris may be manifested only in advanced stages and fever, weight loss, myalgia, arthralgia, or anemia can be the initial symptoms. The diagnosis of TA in patients in this phase of the disease may be challenging as there is no diagnostic serologic test. However, in both stages, cutaneous manifestations may be present in 2.8%–28% of patients. Ischemic ulceration in TA may be rapidly progressive, treatment-resistant, and potentially fatal. ACR has laid criteria for diagnosing TA [Table 1]. A score of three or more has a sensitivity of 90.5% and specificity of 97.8%. Our patient fulfilled three of six criteria. Lesions considered to be “specifically” associated with TA have been described most frequently simulating erythema nodosum, erythema induratum, and PG. It has also been reported with chronic or subacute inflammatory disease such as chronic tonsillitis, tuberculous lymphadenitis of the neck, chronic hepatitis B, Crohn's disease, and ulcerative colitis. Association of PG with TA has been explained on the basis of the presence of autoantibodies to elastin in both conditions. Both TA and PG respond to corticosteroid which is considered as first-line therapy in both the conditions. It has been suggested that 50% of patients respond to corticosteroid therapy alone, but 50.5% of patients relapse during corticosteroid treatment. In such situations, cytotoxic/immunomodulatory agents such as cyclosporine, methotrexate, azathioprine, and cyclophosphamide have been suggested. Tumor necrosis factor alpha inhibitors and other biological therapies been have also tried with variable success., Revascularization is considered in severely stenotic or dangerously dilated vessels only. In steroid-resistant PG, methotrexate, minocycline, cyclosporine, and intravenous immunoglobulins are tried with varying success. First-line therapy in disseminated PG is systemic treatment with prednisone (0.5–1 mg/kg/day) or cyclosporine (5 mg/kg/day) alone or combined due to their anti-inflammatory and immunosuppressant properties and rapid efficacy. Knowledge of the skin manifestation associated with TA remains important for its diagnosis and initiation of treatment. Patients with PG should be examined thoroughly for co-existence of TA. Although this association is seen mostly in women, young males also can be affected as in the present case. Recurrence of PG is common even with full course treatment. Dexamethasone pulse therapy is an effective treatment modality for PG as seen in this patient. Cox NH, Jorizzo JL, Bourke JF, Savage CO. Vasculitis, neutrophilic dermatoses and related disorders. In: Burns T, Cox N, Breathnack S, Griffiths C, editors. Rook's Textbook of Dermatology. 8th ed. Vol. 3. New Jersey, United States: Wiley Blackwell; 2010. p. 50, 64-73. Soni AD, Vora DS, Bohra S, Shah JS. Pyoderma gangrenosum: A systemic review of incidence and prevalence. J Clin Stud 2015;7:42-5. Richetta AG, D'Epiro S, Mattozzi C, Giancristoforo S, Calvieri S. Folgoration as an example of pathergy in a patient affected by pyoderma gangrenosum and Takayasu's arteritis. Dermatol Res Pract 2009;2009:393452. Su WP, Davis MD, Weenig RH, Powell FC, Perry HO. Pyoderma gangrenosum: Clinicopathologic correlation and proposed diagnostic criteria. Int J Dermatol 2004;43:790-800. Bommakanti J, Prasad GK, Srujana B, Chowdary KV. Pyoderma gangrenosum secondary to Takayasu's arteritis. Int J Clin Biochem Res 2015;1:88-91. Wylie G, Evans CD. Takayasu arteritis complicated by abdominal ulceration. J Am Acad Dermatol 2009;3:AB65. Klimusina J, Oberson M, Valentino MD, Ruchat M, Wyttenbach R, Alreci M, et al. An unusual case of large vessel vasculitis associated with pyoderma gangrenosum. Cardiovasular Med 2011;14:185-8. Taïeb A, Dufillot D, Pellegrin-Carloz B, Calabet A, Clémenty J, Guillard JM, et al. Postgranulomatous anetoderma associated with Takayasu's arteritis in a child. Arch Dermatol 1987;123:796-800. Fearfield LA, Ross JR, Farrell AM, Costello C, Bunker CB, Staughton RC, et al. Pyoderma gangrenosum associated with Takayasu's arteritis responding to cyclosporin. Br J Dermatol 1999;141:339-43. 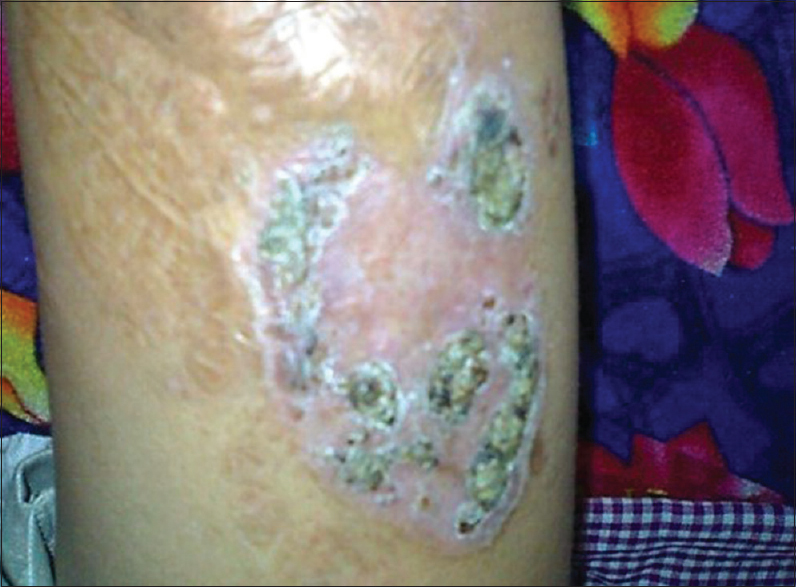 Ghosn S, Malek J, Shbaklo Z, Matta M, Uthman I. Takayasu disease presenting as malignant pyoderma gangrenosum in a child with relapsing polychondritis. J Am Acad Dermatol 1998;59:84-7.